Like a pilot needs a checklist and a navigation system, companies need a template to help guide them on their journey to delivering exceptional customer experiences through a Customer Experience Management (CEM) strategy. This is where the CEM concept begins to become embedded in your organization's DNA. Review Current Business Performance - This includes all operations that contribute to revenue, costs and profits. Which ones are most directly tied to CEM? Consider such dynamics as growth, retention, win-back and return on investment (ROI). 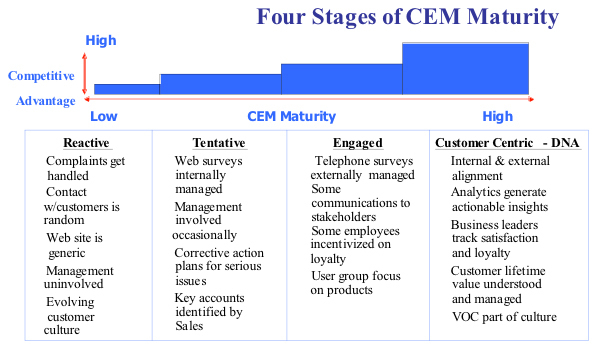 Review Current CEM Maturity Level - As illustrated in the Four Stages of CEM Maturity, you will determine whether your organization is reactive, tentative, engaged or customer-centric. Knowing your starting point is vital to setting CEM objectives and measuring progress and results. Management Interviews - Interviewing your key management in all customer-facing areas is critical to achieving buy-in on the process and to build consensus on key objectives for each of the 12 building blocks. Vision + Mission Statements - This is where you make CEM part of your organizational "DNA." This includes adding customer-centric language to the vision and mission statements to maintain consistent focus on the goals of CEM. Determine Long Range Goals w/Timetable - Based on your current CEM Maturity level and management interviews, you can make realistic, achievable goals for CEM implementation, along with a detailed timetable. Branding the CEM Program - Many companies elect to "brand" their CEM initiative"Customers First" for exampleto communicate their program in a memorable way. Branding is the basis of establishing a communications campaign that will ensure high visibility and long-term commitment to a successful outcome. This helps to rally support among stakeholders, including employees, customers, suppliers, shareholders, and channel partners. While similarities naturally exist, no two customers are the same. Each one has its own set of needs and business models that shape their expectations of doing business with your company. As a result, you cannot consistently exceed the expectations of each customer if you treat them all the same. As part of our CEMDNA Playbook Strategy, we have identified four approaches to help you understand the needs of each major type of customer so you can create a CEM strategy designed to succeed with each type. This process is meant to leave nothing to chance in your interactions, regardless of the specific customer touchpoints involved. Segment Customer Base - Do you know who your key accounts are? As a group, they make up just 20% of your customer base but deliver 80% of your revenue. These are key accounts that you cannot afford to lose, so you want to be sure their expectations are consistently exceeded. You also probably have some strategic accounts with tangible "big name" value or are in new markets you want to develop, even though they may not yet be generating a significant amount of business. You can't afford to lose them either, so commit to a high level of customer service and support. Then there are marginal or "dead" accounts whose business contributions are limited, but still provide a revenue stream and occasionally make a new purchase. These are not "strategic" accounts, so you don't want to invest too much in service and support. In fact, if these accounts are unprofitable, you may be better off without them. Key Accounts & Segmenting Contacts - Since these are your company's "bread and butter," this step drills down into key accounts identified in the segmentation step above. Here, further distinctions are made according to decision maker, recommender and influencer at each key account. This is vital since the expectations of each type of individual will vary, and this dictates the level of service/support that should be expended to consistently exceed those expectations. Company 360 Alignment - This step examines your perception of the customer experience with the customer's own experience or reality. Through a series of interviews with customer-facing staff, we capture your perception, including data based on any actual surveys already conducted. Capturing "reality" requires an independent survey conducted by a third party, such as Omega, to obtain actual "unvarnished" views of how customer centric the culture is and how well you're consistently exceeding customer expectations. Comparing these views is always revealing, and helps you understand where you fall on the CEM Maturity Scale. Action Alerts - In the course of normal interaction with customers, and specifically in survey work associated with a Company 360 Alignment, situations will arise that create an unexpected revenue opportunity and/or an unforeseen problem situation. Responding as quickly and as efficiently as possible is key to exceeding customer expectations in ad hoc situations like this. We provide a formal, company-wide Action Alert℠ event procedure to make sure the situation is captured by date & time, point of contact, name, title and company of the customer. The Action Alert includes a full description of the situation, good or bad, and a pre-determined escalation procedure is executed to act on the alert as quickly as possible. Partnering for Profit - This is a methodology to ensure your key accounts view you as a value-added partner. The objective is to help you establish an ongoing, proactive relationship with your most valuable customers by consistently communicating the value of the services/products you provide. This approach typically results in retaining and growing key accounts and generating new business referrals. The basis for this methodology is to maximize the value of your product/service within your key accounts that results in increased productivity and profits for your customers. The foundation of a customer-centric culture is based on implementing a structured, measurable strategy, but there are various CX technologies that can be key enablers of a successful CEM program. We have identified 12 technologies that all play a role in managing and/or interpreting the composition and impact of various aspects of the customer experience. We all know it takes engaged employees to deliver consistently superior customer experiences. Take the omni-channel approach to employee-customer engagement by tapping into phone, email, online chat, social media and other methods of direct customer interaction. Based on the appeal of video games, mobile apps and streaming content, gamification has also proven to be effective in engaging employees for greater performance. The key is to balance the needs of agents and customers to optimize productivity and CX. Although an increasing amount of customer service is done remotely and/or online, there is still a considerable amount of direct customer service performed in the field, either at customer locations or a company's own field service centers. Starting with initial contact with the customer, where field service incidents are created, it's important to provide tools to both support the resolution and to allow customers to stay informed/provide feedback and ultimately be satisfied with the outcome. Help desks generally are internal operations that assist employees and business partners to manage their various IT assets. Start by hiring and training good employees who are inspired to provide exceptional support. Have a well-defined Service Level Agreement (SLA) in order to provide optimal, first-level support service to all departments. Make it a priority to develop a helpful culture where issues are tracked end-to-end and nothing slips through the cracks. These three CX technologies are inter-related. Knowledge Management (KM) sets the framework and strategy for an organization's culture and processes that management uses to install enabling KM technology that fits with its corporate politics. Self-service portals offer authorized users an omni-channel approach to getting the information they want to solve their questions and operational issues. And of course, remote service and support typically are functions of KM and self-service. These three CX technologies are also inter-related. EFM systems handle customer data collection and analysis based on that data. Business intelligence tools dig deeper to perform more advanced discovery, apply predictive analysis to help define future customer behavior and/or business impacts, and provide extensive enterprise reporting. CX certification training is gaining more importance as organizations recognize the need to be certified in the principles and tactics of effective CX training to best leverage the EFM and BI outcomes. Clearly these CX technologies are joined at the hip. Big data is a way of aggregating and examining the huge amount of CX/CEM data collected to uncover both obvious and obscure patterns and inter-relationships. With text mining and analytics technology, you can analyze text data from the web, social media, comment fields, books and other text-based sources to uncover insights you hadn't noticed before. Speech analytics has a similar intent as text analytics, but it works with unstructured spoken words to determine frequency of comments and sentiment to measure positive, neutral and negative remarks. SFA was the application that essentially launched CRM decades ago. The idea is to build a database of every meaningful detail about customer purchases, demographics, and needs and wants so the organization can pinpoint what products and services a given customer may purchase in the future. SFA addresses the various tactical functions that affect CX execution. A natural extension of CRM and SFA, marketing and social media automation incorporates everything you need to know about your leads and customers in one place. Since social media channels have such an impact on marketing and customer relationships, it just makes sense to consider them together. Customers expect omni-channel experiences through multi-channel engagement with vendors and suppliers. This is part of the evolution in customer buying behavior that has changed the landscape of traditional customer engagement. Understanding which customer experiences and touchpoints are driving the best results can be a challenge. Omni-channel platforms capture the importance of using multi-channel marketing to effectively reach, engage and convert your customers. Trial and error is typically a necessary approach to finding the right channel mix for each type of customer. Online communities exist everywhere today, from general purpose channels like Facebook, Twitter and LinkedIn to specialized communities we all know, such as CustomerThink, CCNG and CRMxhange. But managing these forums effectively is a matter of governance. Agree on your forum governance model. How involved do you want to be in managing your forum? Agree on intervention protocols. What kind of comments, questions and issues are going to prompt a facilitator intervention? Determine intervention procedures. What are your approval processes for releasing intervention content? Determine intervention responsibilities. Who is your primary facilitator/site manager? Ensure proper training for facilitator/site manager. Can someone with extensive customer service experience handle the site? Do they need specialist media training? Ensure community members know rules of engagement. Make sure the moderation rules are appropriate for your forum. IVR/ACD Automation We're all familiar with these systems. They're the anchors of contact center operations and some of the oldest examples of CRM technology. Interactive Voice Response (IVR) allows a computer to interact with humans using voice commands or tones from a telephone keypad. Technically, IVR lets the caller enter an "ID" or account code, then provides access to a database. This is where the "interactive" part comes in. For example, bank credit unions often have "phone bank" systems that allow you to conduct transactions. Automatic Call Distribution (ACD) systems answer incoming calls and allow the caller to choose a menu, group of extensions or singular extension to which the call is routed. Contact centers use ACDs to organize incoming calls into queues of callers waiting to speak with an operator or service person.